This study was aimed at evaluating the extraction of β-carotene and the color of baby carrots pre-treated with pectin methylesterase (PME) which were infused with calcium using high pressure processing (HPP) (discussed in Part I) and calcium lactate gluconate (CLG) as an infusate solution. The amount of β-carotene extracted from high pressure treated baby carrots was three to five times higher than the unprocessed baby carrots. Although HPP overall increased the extraction of β-carotene, none of the processing variables (pressure, time, CLG solution concentration) were found to correlate significantly with the increased extraction. The combination of pressure (MPa) and time (min), however, had a significant influence (p value < 0.05) on β-carotene extraction. The L* color values of the HPP-assisted calcium-infused baby carrots were lower than that of the unprocessed control, indicating mild to moderate darkening of the baby carrots after the infusion of calcium using HPP. Pressure cycling, which was found to significantly enhance the amount of calcium infusion reported in Part I, did not significantly increase the amount of β-carotene extracted from the processed baby carrots and it did not further change their color. PME pre-treated baby carrots did not alter the extraction of β-carotene and the color of the processed baby carrots after HPP. 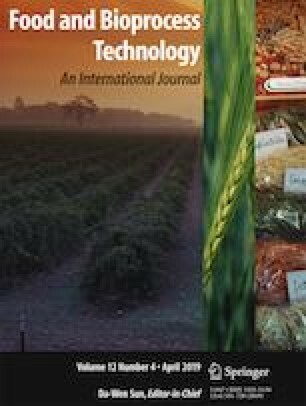 Authors thank Dr. Youn-Kyung Kim and Dr. Loredana Quadro at the Department of Food Science, Rutgers University, for their help with the operation of HPLC for β-carotene analysis; Dr. Juzhong Tan, Department of Food Science, Rutgers University, for his valuable inputs. Partial financial support provided by the New Jersey Agricultural Experiment Station is appreciated.